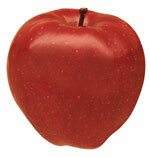 A round, bright red apple with an aromatic, rich flavor when cooked. 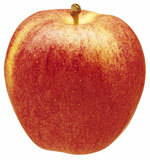 The Rome is a slightly tart apple that tastes somewhat bland when eaten raw, however when cooked its flavor is enhanced. It makes a good pie and cobbler apple because is holds its texture and shape when baked. This apple is also known as Rome Beauty. A tart, crisp, juicy apple with freckled green skin that is suitable for both eating as is and for cooking. Granny Smith apples are imported from New Zealand and Australia and they are also grown in the United States, mainly in Washington and California. 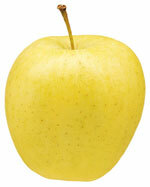 Firm, crisp flesh and a unique, tangy-tart, sweet flavor are characteristic of this apple. Snackers and bakers give the variety high marks in consumer tastings. 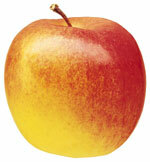 Cripps Pink, also known as Pink Lady®, is the last apple harvested in Washington state in late October. Crisp fall nights bring on the bright pink color that gives the apple its name. Supplies of Cripps Pink last from November to August.